While DSLR manufacturers have been pushing sensitivity settings up so that ISO 12,800 (equivalent) is now becoming commonplace, Panasonic is a little more conservative with its MSCs and the G10 has a maximum setting of ISO 6400. This is the same as the G2 and a stop faster than the G1. However, even at the lower sensitivity settings noise is visible in some even-toned areas. This doesn’t really become a problem until around ISO 1600. The shadows of raw images taken at this setting have quite a lot of chroma noise, with red speckling being particularly noticeable. 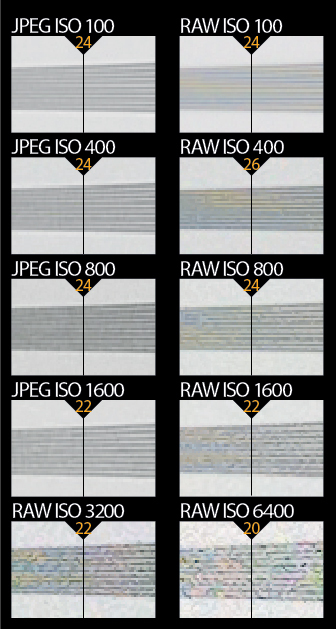 Although the JPEG files captured with the standard level of in-camera noise reduction applied are smoother and have less colour noise visible, they contain a little less detail than the simultaneously recorded raw files. Our resolution tests confirm that the G10’s resolution is on a par with the previous Panasonic G-series cameras we have tested, and in good light it can out-resolve some 12-million-pixel, APS-C-format DSLRs. The resolution chart images shown here were shot with the new G Vario 14-42mm f/3.5-5.6 Asph Mega OIS lens, indicating that it is another high performer. These images show 72ppi (100% on a computer screen) sections of images of a resolution chart, captured using the kit lens set to 35mm (70mm equivalent). We show the section of the resolution chart where the camera starts to fail to reproduce the lines separately. The higher the number visible in these images, the better the camera’s detail resolution is at the specified sensitivity setting.